JERUSALEM were formed in the early ’70s and after releasing a self-titled album in 1972, they disbanded only to reform in 2008. They released their second album “Escalator” which was followed by the critically acclaimed “Black Horses” released in 2014. For their fourth album, with original members LYNDEN WILLIAMS on vocals and BOB COOKE composing, they are joined by the cream of prog rock musicians GEOFF DOWNES (ASIA & YES) and NICK D’VIRGILIO (TEARS FOR FEARS & SPOCKS BEARD). They have created a stunning prog rock album that ticks the boxes on all musical and creative fronts. If 2014's "Black Horses" saw the ensemble trying to locate light moments in a bleak environment, its follow-up nails current situation on the head, what with Lynden Williams' adoption of declarative delivery. Such stance is used to great effect in opener "Snake" whose riffs vigorously bite into philosophical and political comments, but the key to the piece's proud position would be the "when you were younger" line, the past being a recurring theme here. In this context, the glorious "Simple Man" - written around the time of the group's 1972 debut and restored for eventual recording now - has an air of nostalgia about it, while "Drums, Bass And Guitar" serves up a romp through rock 'n' roll era, listing each decade's attributes, on a harmonica-enhanced slab of rhythm-and-blues. Categorization of this release is difficult. Everything is normal on the one hand, and on the other influences are spread wide. Rock, melodic rock, pop, power pop, blues are completely natural aspects making for a diverse record. The fantastic "Steaming Hot" with a lot of organ sound and a nice guitar solo cries out for a live version, and also the power rocker "All My Doors Are Open" would be well suited to a live performance. Basically you would have to discuss every single song in detail from this album to do it justice. There is refined harmonica and crisp blues on "Drums, Bass and Guitar", and the rocker "Northern Nights" has intense melodies, then there's the power pop of "Simple Simon" with its haunting refrain. There are sill calm tunes such as "The Book Of You", to contrast with the power. An album without failure, which lacks only the occasional hit. 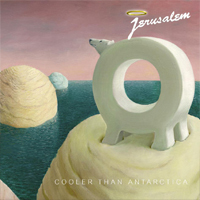 In terms of proginess, what Jerusalem serve up, resides in the more rock with a slice of prog side of life, than the other way round, all of the songs reliant on a strong sense of melody and structure to get their message across. Lyrically however things are a little more quirk-driven, a sideways glance at the modern world being where everything stems from. This approach works best on the bullish "Steaming Hot", the pulsating beat driving a comment on the wish to be young and beautiful forever..."Northern Lights" shows the band at their best, the urgent, furtive rhythm carrying you along at a magnificent lick that is as enigmatic as it is engaging. In "Northern Lights" the violin even gets a bit part, and Lynden Williams voice resounds with rich chimes. Here and there it is drawn from the blues and folk style which will sharpen your focus as it contrasts with the guitar rock. Fair is fair, Jerusalem can finally get the attention they deserve. Excellent guitar rock that will amaze, and that does not surprise me with such a good line-up.